When life knocks you down, steals your joy, and takes away your livelihood, what can you do? God says, “Live on what’s left!” Right. So how easy is that? Let Sheila Bailey show you how. Go sell the oil. . .and live on what’s left. Makeovers with Leftovers will renew your hope, refresh your joy, and help you remake your image into His. This book is great for Individuals, Retreats, Bible Study Groups, and Conferences. Or, buy it now on Amazon.com! Dr. Sheila M. Bailey has carefully composed a very satisfying work of art. "Makeovers with Leftovers" is a true treasure for every believer. Dr. Bailey's insight is timeless, practical, courageous, and refreshing. Readers will not only rejoice, but also be encouraged and inspired. In Makeovers with Leftovers, Dr. Sheila Bailey provides biblical, practical, life-changing principles that assure us that, even when devastation and drought have ravished us, life is not over. Her work is destined to become a classic on empowered Christian living. "Sheila Bailey's book, Makeovers with Leftovers", is an insightful compendium of practical Biblical knowledge that will encourage you on your life's journey. Sheila explores the depth of her grief (following the loss of Dr. E.K. Bailey) and illustrates how God's word enabled her to take the leftovers of her life and begin to live victoriously." 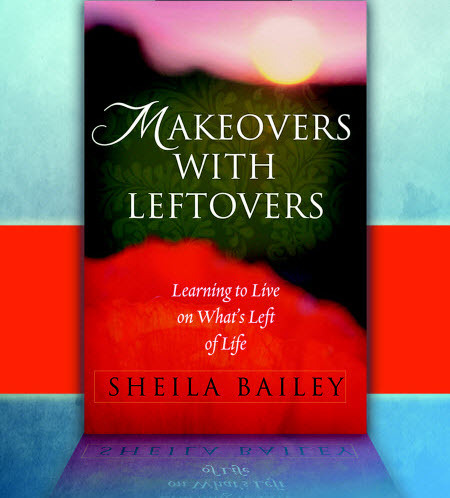 I highly recommend Dr. Sheila Bailey's book "Makeovers with Leftovers" which is an insightful Bible Study. Sheila Bailey is a gifted teacher and instructor on spiritual growth and spiritual walk. I myself am using this Bible Study in my church. Life lessons are powerful. Sheila Bailey has opened up her heart, and shared real life lessons, to us a way forward when our lives seem to be in neutral. "Makeovers with Leftovers" gives us a powerful and personal testimony to the statement "little becomes much when you place it in the master's hand." Don't miss this opportunity to experience encouragement and hope. Note: These products and services are sold "for profit" and do not directly benefit the non-profit Sheila B. Ministries. Checks or Money Orders made payable to "Sheila Bailey."